If you are like me, then you probably enjoy the convenience of the Build Configuration menu inside of Visual Studio.NET. This is the menu that contains the "Debug" and "Release" modes for project deployment configuration. Well when I build a new machine or re-install VS.NET, I notice that the build dropdown is not always displayed by default. So here are a few simple steps to get the menu back being displayed. 2. To now enable the menu goto the Tools -> Options menu. On the left side expand the "Projects and Solutions" section and select "General". 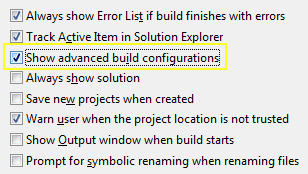 Then on the right hand side, check the box that states "Show advanced build configurations". That's it! You should now have an enabled build configuration menu in VS.NET.